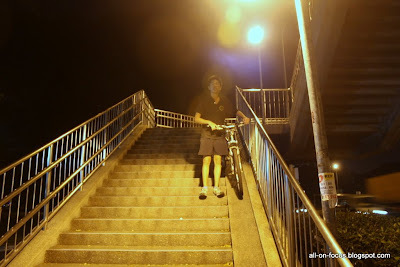 The trip to getting around Singapore was fun. Initially, Xuyun had planned a whole lot of route on Google Maps and show me loads of alternative routes around Singapore. But, we had a big gap in the viewpoint of cycling as he wanted a more fast on-the-road kind and i definitely prefer the safe-old foot/cycle paths. He changed his mind and worked out a different route and came out with a "challenge" for himself. 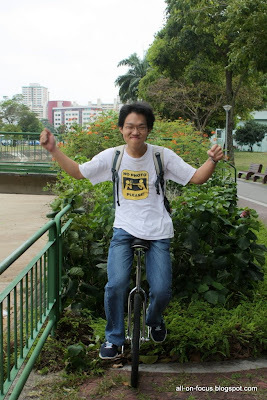 Cycle on a unicycle the whole way. A crazy idea but it was interesting to see many heads turn around when we cycle and questions were asked when we stopped. The unicycle have me going nuts whenever he falls and tries to mount as a loud crash could be heard and a huge relief to see him unscratched. 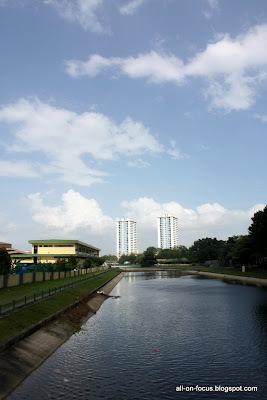 We had loads to see as we were using the park connector which started from my estate and I never ever knew it existed! But its never too late to explore Singapore. An account of Xuyun i took from facebook: "haha oh we just followed the park connector from bishan to kallang, then kallang, anyhow whack. use iPod's maps function to find our way there. End up there, then turn back. Had dinner at Carl's Junior then went back. FUN!!!" I totally agreed with him! It was totally FUN!! The one thing i need to thank is the power of the itouch! sad that it didn't have a built in compass. 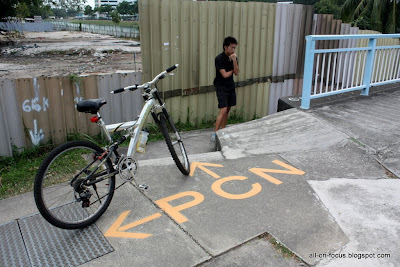 Although, the park connector (PCN) is swift easy and fun to travel in, the steps sometimes requires you to travel by carrying your bike. (not good at all) All overhead bridge had a side slope (see the left picture) to assist you in moving your bike up or down, however, there one bridge without that so i had to carry it. 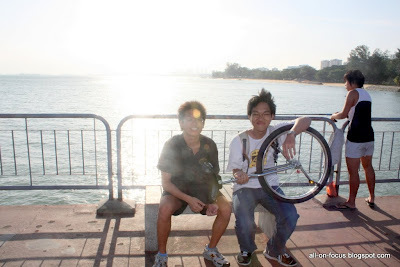 But overall, it was fun, even meet with angie, eio and shawn at east coast park. (ECP) Hoping for more trips like this! new upgrades to paige a.k.a my camera!